The Defense Advanced Research Projects Agency has established an industry consortium that will develop rules for the robotic servicing of satellites in space, Space News reported Tuesday. 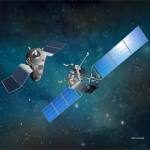 Todd Master, a DARPA program manager, told the publication that the Consortium for Execution of Rendezvous and Servicing Operations will invite industry players such as satellite operators to participate in the creation of nonbinding rules. DARPA expects companies to comply with the consortium’s rules on a voluntary basis to demonstrate the safety of their in-orbit robotic servicing to investors and customers. DARPA has chosen Summerville, South Carolina-based contractor Advanced Technology International to oversee the consortium. Master hopes to see the first draft of in-orbit robotic servicing standards within a year.